It's time for a walk down memory lane. Butter London was the first brand of nail polish I used after moving to Australia; I'd heard of the brand before, but we never formally crossed paths. There's no turning back now. Cheeky Chops - my sunny day shade and it also makes for a great conversation starter! Slapper - a creamy teal which jumps off your nails -- it's shockingly good. Blagger - the sort of blue that works year-round. Scouse - not quite blue, not quite purple and it has an element of shimmery sparkle too. 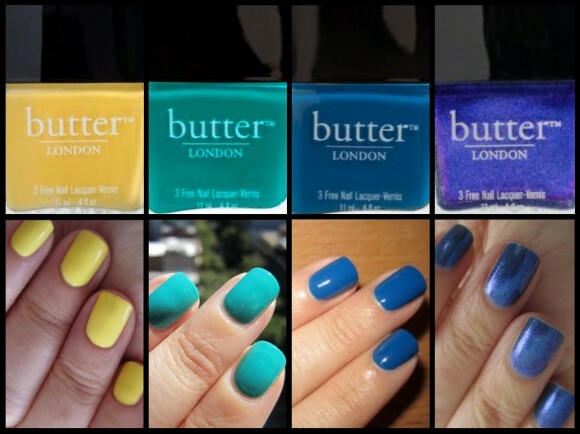 If you love these colours as much as I do, be sure to visit Butter London before 11:59 PM 11 November 2012 and use the code FRIENDS12 when you checkout. To entice you even more, they're also throwing in free shipping for orders greater than $75.00.